Original ticket stub from the MLB Japan All-Star Tour Workout Day on Oct. 26, 1992 at the Seattle Kingdome. Major League Baseball sent a team of All-Stars to Japan on even numbered years from 1986 through 2006 to play a series of exhibitions against Japanese pro teams. 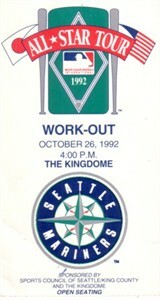 This ticket was from a workout day hosted by the Mariners for the All-Stars to prepare for their trip. Has minor surface creases on the back and other minor flaws/wear. ONLY ONE AVAILABLE FOR SALE.